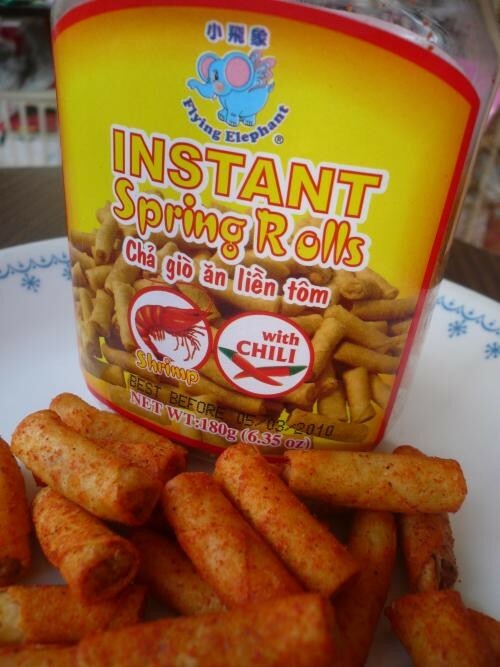 While these little buggers aren't faithful reproductions of Vietnamese cha gio, or crispy spring rolls, Flying Elephant brand Instant Spring Rolls are embodiments of the malevolence of miniaturization, in which the snack maker achieves a result so twee and inoffensive in appearance that the snacker is powerless to stop eating as long as said snack is within arm's reach. The detail with which the crunchy spice-dusted wheat-flour wrapper envelops the interior conjures up assembly lines of Lilliputians slaving away, despite clear evidence the snacks are produced by a combination of shrink ray and food replicator (they're "instant," after all). I found an assortment of flavors near the register at Uptown's terrific pan-Asian Golden Pacific Market (your one-stop shop for Filipino sour pork-rib stew), including shrimp with chile, garlic with chile, and anchovy. Foes of fishy-flavored snacks needn't worry. But for the rest of us: resistance is futile.